This is a very important show to me. It benefits Surel's Place, the home of the late, great Surel Mitchell a long time Boise resident and artist who gave time and time again to the community through her art and by supporting artists of ALL disciplines. Her home is now an artist's residency, housing retreats multiples times a year for artists from all over the country. I couldn't be more honored to play here and help further her mission of giving artists a safe place to create. I have asked some very talented friends to join me, it's going to be a special night, hope to see you there! 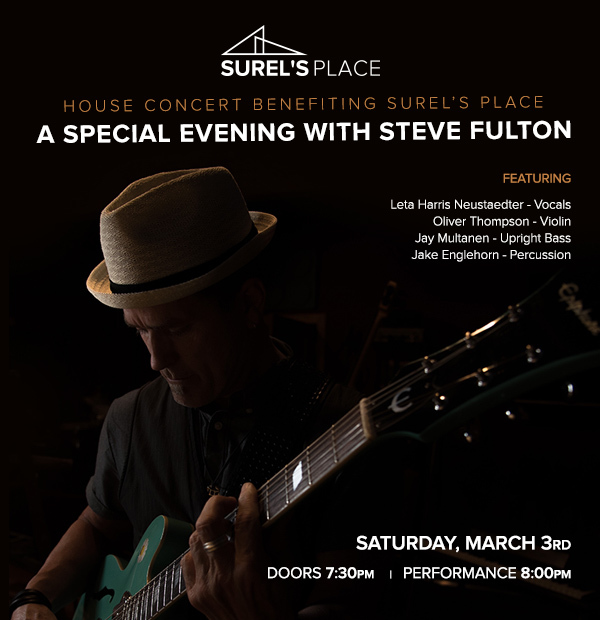 VIP package $70 includes Includes pre-concert reception with Steve Fulton from 6:30pm - 7:30pm, hosted wine & beer, catered meal-worthy appetizers, and a copy of "Eponym"